Originally developed for the police force and military groups, the Hunter is designed to be reliable and durable to the extreme. You’ll have no worries about moisture when hunting or sailing. Listening for wildlife will no longer be a problem. Reusable silicon tips make it possible to pass the Hunter between individuals. Simply change the tips and the unit can be assigned to another individual. This is a critical feature for law enforcement officers or security agents. The tips come in small, medium and large sizes. The Hunter has a patented waterproof screen over the microphone sound port and battery compartment. The screens have microscopic holes that allow sound and air to pass through but keep water out. This makes it a great choice for hunting enthusiasts who may be in damp weather conditions and suitable for moderate surface swimming. A built in telecoil means the Hunter can be used with two-way radios, without any wires going to your ear. To use it, switch the aid to “T” mode, and connect the induction loop to your two-way radio. To get the best reception, put the induction loop around your neck. 2000 – 6000 hz Frequency range. Has a battery life of 460+ hours. Hunter BTE Hearing Aids come with a one year factory warranty that covers all parts and labor. Precise Hearing has a 30 day money back period from the date of shipment. 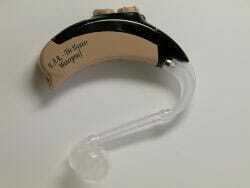 We return 100% of the purchase price of the hearing aid. We do not return shipping costs.